Before undergoing surgery, patients must be fully informed about what the procedure entails. The complex nature of the information involved means that patients often feel overwhelmed rather than well informed. Researchers from Charité – Universitätsmedizin Berlin have been able to show that patients scheduled to undergo cardiac catheterization may find comic-style information helpful. The researchers’ comic-style booklet was shown to help patient comprehension and reduce anxiety. Results from this study have been published in the Annals of Internal Medicine*. The purpose of the informed consent procedure is to enable patients to make an autonomous decision for or against a specific type of treatment. As part of this process, patients are provided with details of what the procedure entails. They also receive advice regarding expected medical benefits and potential risks involved. However, patients with coronary heart disease have been shown to not fully grasp the basic procedural steps involved in cardiac catheterization even after undergoing this informed consent procedure. Because of this, patients were also unable to evaluate the benefits of this procedure. “Inspired by the notion that ‘a picture is worth more than a thousand words’, we wanted to use graphical representations to help patients understand the procedural details provided as part of the informed consent procedure,” explains Prof. Dr. Verena Stangl of the Medical Department, Division of Cardiology and Angiology on Campus Charité Mitte. Prof. Stangl worked alongside Dr. Anna Brand, the study’s other lead investigator and a fellow cardiologist to develop a 15-page comic-style booklet which explains the most common procedure in the field of cardiology – cardiac catheterization, followed by (where required) the insertion of a stent to open a narrowed or blocked artery. “What our pilot study showed was patients who received this comic-style felt better prepared for surgery,” explains Prof. Stangl. The comic-style booklet proved useful in all three categories. When presented with questions on procedural details, risks and postoperative advice, patients who also received the comic-style information booklet were able to provide correct answers to nearly 12 out of a total of 13 questions on average. This compared with a mean score of approximately 9 out of 13 questions in patients who had undergone standard informed consent alone. 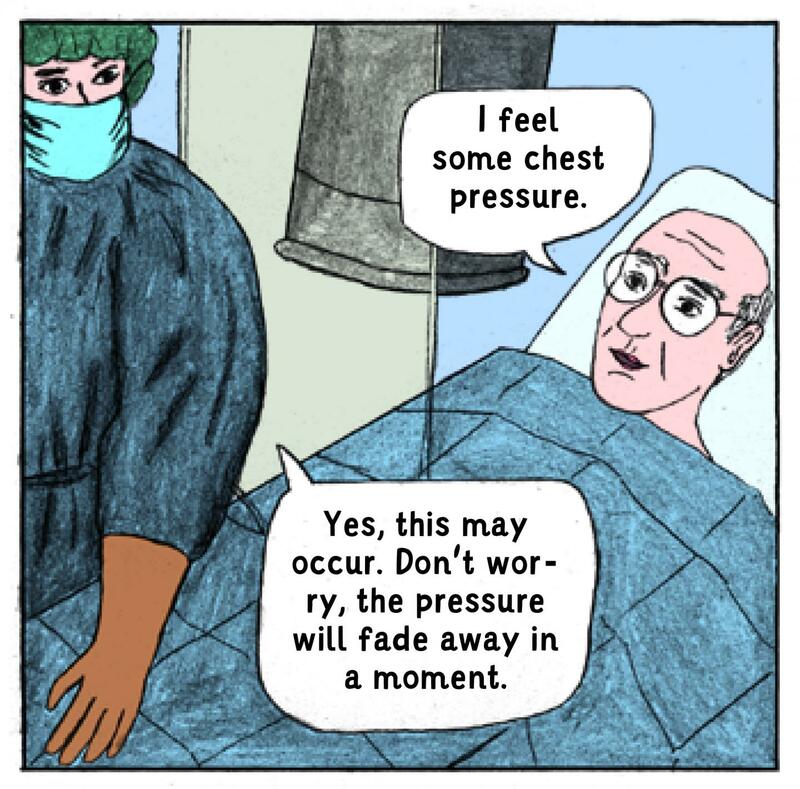 Patients in the comic-style information group also reported feeling less anxious after their informed consent procedure. Overall, approximately 72 percent of participants were satisfied with the comic-based information booklet and reported feeling well prepared for cardiac catheterization. This compared with only 41 percent of participants in the standard informed consent group.